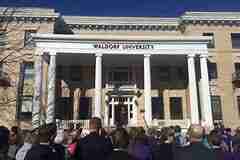 Two alum were recently recognized during Waldorf University’s Homecoming festivities with the prestigious Alumni Distinguished Service Award. Waldorf University President Dr. Robert Alsop (left) presents the Alumni Distinguished Service Award to Scott Anderson, Class of 1977. Anderson was recognized for outstanding contributions to the financial services industry and exemplifying the ideals of Waldorf University. Waldorf University President Dr. Robert Alsop presents the Alumni Distinguished Service Award to DeeAnn Vaage, who accepted the award on behalf of her husband, Rev. Robert Vaage, Class of 1979. Rev. Vaage passed away in 2016, but was posthumously honored for his selfless dedication to the church and inspirational leadership in living a life of service and furthering the mission of Jesus Christ.